Porsche Boxster 2.5 S 2dr PDK 2019 Review | What Car? The S model gets a standard mesh wind deflector, 19in wheels, part-leather interior and sports seats, as well as extra styling details. You'll still want to add plenty of options, though. 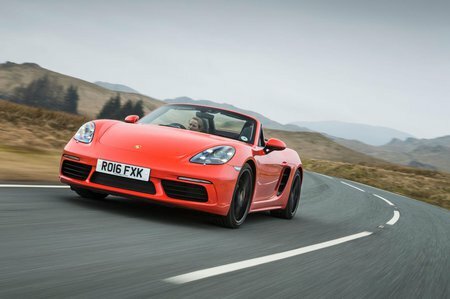 This 345bhp 2.5-litre engine gives the lightweight Boxster fairly extreme performance, with a seriously potent mid-range and the ability to rev strongly to the 7500rpm redline. Below 2000rpm, you get a noticeably delayed accelerator response, but otherwise this is a flexible engine. Shame it doesn't sound better, though.